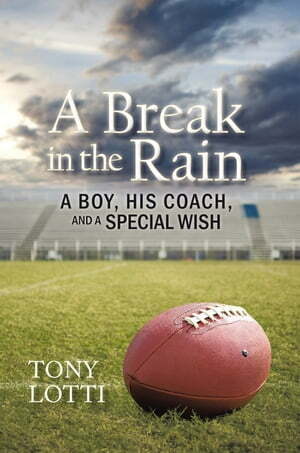 Collins Booksellers - A Break in the Rain by Tony Lotti, 9781462007837. Buy this book online. Mikey Carmello loves football. Appointed manager for a high school team, Mikey has but just one dream in lifeto score a touchdown for his beloved Wolves. Unfortunately, everyone thinks it is too risky for Mikey to play footballhe has Down syndrome. But as football season ends, Mikey has no idea that someone is about to give him a break from the rain. Mikey and the high school football coach share an uncommon relationship. With Mikeys special wish in mind, the coach begins to develop a plan to form an organized football league so that Mikey can safely score the touchdown he has always wanted to achieve. But when Mikeys father is suddenly killed in a car accident, the coach willingly steps into a father role and begins teaching Mikey how everything is possible in lifeif he just believes. As the coach and Mikey step into the future together, both are forever changed by their inspirational journey through adversity, societal labeling, and a victory like no other. A Break in the Rain is a story about how a coach chooses to be a champion for a little boy with a simple wish and lifts himself up in the process.